LAS VEGAS, Nevada–Golden Entertainment have released their 2018 first quarter revenue report. 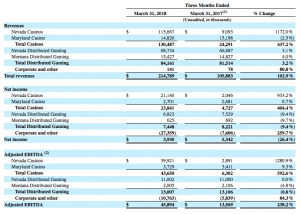 The report shows the gaming company generated $214.8 million during their first quarter, which ended March 31. 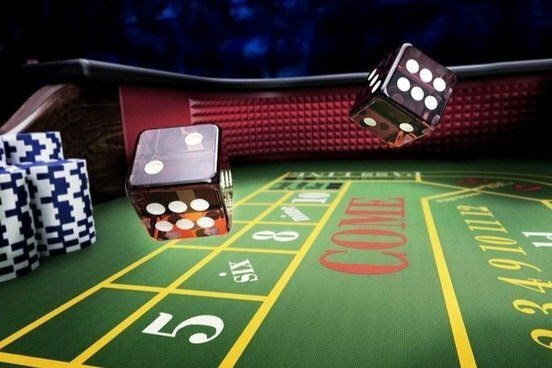 Golden Entertainment are the parent company of the Aquarius Casino in Laughlin, Nevada. Chairman and Chief Executive Officer of Golden Entertainment Blake L. Sartini said, “Our record first quarter results were driven by year-over-year Adjusted EBITDA growth from our Nevada casinos acquired with American Casino and Entertainment in October 2017 as well as Adjusted EBITDA growth at Maryland’s Rocky Gap Casino Resort despite the challenging northeast weather. “Throughout the first quarter we made progress against all of our 2018 strategic priorities. We continued the expansion of our Las Vegas branded tavern platform with the opening of two of the six planned new locations for 2018 and both new properties are on track to generate the attractive returns we have experienced from other recent tavern openings. In addition, we completed the renovation of 110 of Rocky Gap’s approximately 200 rooms to build on its success in the upcoming higher demand summer months. “We also began work on Phase I of our capital investment plan at the Stratosphere which includes room renovations, refreshing the casino exterior, and adding exciting new venues to attract and engage patrons. By the end of 2018, we expect to have completed the renovation of 317 rooms at the Stratosphere as well as the installation of state-of-the-art exterior digital signage and lighting. Further, we intend to add a unique gastro-brewery to the property that leverages our market-leading tavern experience while featuring Golden Entertainment’s signature branded craft beers. This brewery will be connected to a new sports and race book creating a one-of-a-kind experience for our guests. Our continued investment will establish Stratosphere as a preferred destination for Las Vegas visitors and locals alike, and we remain confident that our renovations will generate an attractive return on capital.